their trip and can’t wait to book again. TOK Coachlines has a proud reputation as one of Canada’s leading ground transportation companies. We’ve been safely touring people across North America for over 40 years, so we know what you’re looking for. 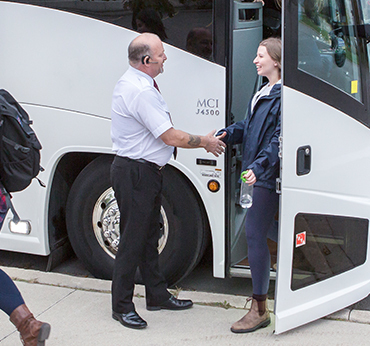 Whether your customers have come to see the Fall colours or need an intercity ride to the airport, we’ll work on all the details with you up-front, so you know exactly what to expect. We’re small enough that we can tailor arrangements to suit your requirements and stay flexible if you need to adjust things mid-way through. And we’ll deliver, on-time, with our well-appointed, comfortable vehicles and highly-trained, welcoming drivers, so that at the end of the trip your customers will give you two thumbs up. Visit our customer service site for more information on how we can help you or contact us now.